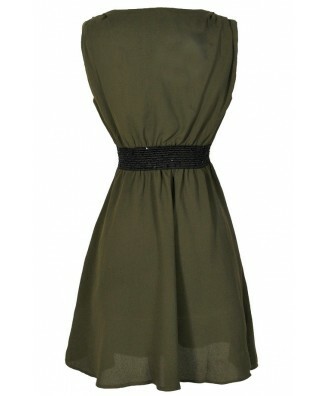 The combination of olive green with the black contrast waistband of this dress gives it a polished look. 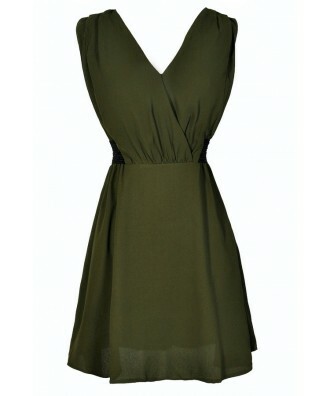 The Extra Olives Green and Black Dress is made of a flowy fabric and is unlined. It has a crossover neckline and an A-line cut. A black waistband with miniature sequins wraps around the sides and back of this dress, creating contrast. 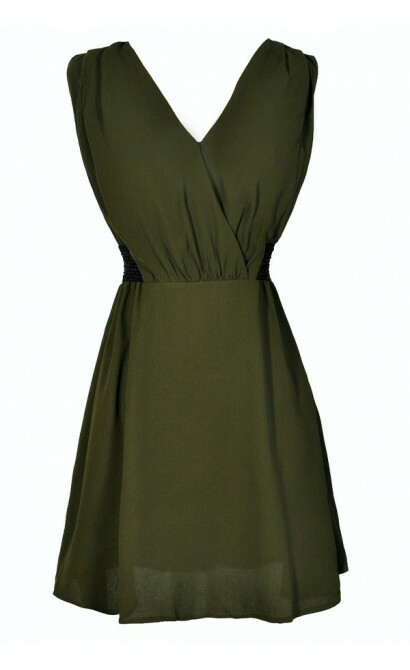 The Extra Olives Green and Black Dress would look nice paired with black boots, pumps, or heels. 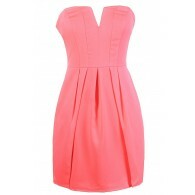 Try pairing this dress with black tights or a fitted black jacket on colder days. 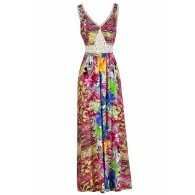 You can also dress it down with flat sandals for a more casual day look. We love the military-inspired color and style of this dress. Details: Unlined. 100% polyester. Hand wash cold. Do not bleach. Iron low. Do not dry clean. Line dry. Small measurements: Length from top of shoulder to hemline: 33". Bust: 33". You have added Extra Olives Green and Black Dress into Wishlist. You have added Extra Olives Green and Black Dress for Stock Notification. You have set Extra Olives Green and Black Dress as a loved product. You have removed Extra Olives Green and Black Dress as a loved product.